Considering sacrilege and irreverence are reality television’s guiding principles, it’s taken a shockingly long while for producers to stoop to using people’s religious beliefs to fuel their augmented slices-of-life. It’s a demonstration of restraint so rare in television’s most vilified genre, it borders on the miraculous. Deeply religious people aren’t new to unscripted television, nor are the ones currently there keeping a low profile: The Duggar family of TLC’s in-limbo 19 Kids And Counting are dominating the news cycle as husband Jim Bob and wife Michelle commit horrific acts of intellectual dishonesty to absolve their son of habitual child molestation and carry on with show business as usual. But whereas the Duggars grew out of the “wacky family” reality subgenre—the same one responsible for Duck Dynasty and Chrisley Knows Best—the new wave of religious reality, with shows like Lifetime’s new series Preach, makes faith, not family, its focal point. Preach trains its eye on four female Christian church leaders, each of whom proudly wears the title “prophetess,” a role comprising equal parts charismatic preaching, prophecy conveyance, faith healing, and southern Baptist showmanship. “For years, preaching was a man’s game,” says prophetess Taketa Williams in a dramatically recited talking-head monologue. “But now, it’s our turn, and it’s our time… We are breaking the stained-glass ceiling.” Taketa and the other oracles of Ohio—Belinda Scott, Kelly Crews, and Linda Roark—speak messages directly from God to their respective flocks, and they nurture the gift in others. Each of the women has selected a protégée to mentor over the course of Preach’s six-episode season, and one of the four protégées will be selected to become a prophetess after proving they have what it takes to act as a divine vessel. That description, which Taketa provides in an introductory voiceover, makes Preach sound like a reality competition, but the show is hardly America’s Next Top Clergywoman. To the extent the show sounds like it’s heavy on soothsaying consultations à la Long Island Medium, it isn’t that. The initial supertease also suggests Preach is partly a Real Housewives-style slow-burning cat fight, but it isn’t that either. As for what Preach is, it’s a fairly straightforward docuseries tarted up for the benefit of drama-starved reality-trash junkies. Judging from the pilot alone, there’s enough raw footage for an earnest, resonant show about the lives of clergywomen who are held in as high regard as their male counterparts. But instead of following that story, the producers of Preach feint in directions that suggest a more provocative show that never materializes, doing a disservice to the show Preach could be as well as the one the producers want the audience to think it is. The neither-fish-nor-fowl nature aligns Preach more closely with Oxygen’s religious reality shows, Preachers Of L.A. and Preachers Of Detroit, than it does with Lifetime’s adjacent property, Preachers’ Daughters. The religious reality subgenre is still in its nascent stages, but Lifetime has already staked out the bottom of the barrel with Daughters, which pretends to be about young women trying to discover themselves in restrictive households. In fact, it feeds on and plays to paternal anxiety, constantly insinuating that because they behave in a typically coquettish way and have pastors for dads, its teenage subjects are doomed to a life of promiscuity. It’s another example of how Lifetime courts disaster with its reality slate. The channel’s schlock-friendly brand identity grants it some latitude to include questionable guilty pleasures, but between Dance Moms and the bi-coastal Little Women franchise, there isn’t nearly as much latitude as the network’s executives seem to think. Preach, like the Oxygen shows, takes a somewhat substantive look at the lives of its four prophetesses and their protegees, but its producers festoon the show with cheesy reality tropes. The prophetesses are to be applauded for their refusal to perform female animosity for the cameras, because the way Preach is assembled, the producers would have used much more ersatz conflict were they able to wring from their subjects. Though it could have been much worse, Preach still speaks the language of Bravo productions, including a talking-head burn to accompany nearly everything that takes place. 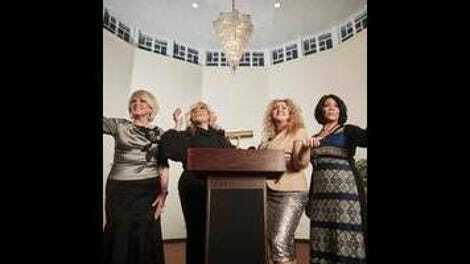 In the pilot, the four women take the stage together at Cleveland Heights’ New Spirit Revival Center, the church Belinda co-pastors with her husband Darrell. Linda takes the mic and starts commanding the crowd with the gravelly growl typical of charismatic preachers, and Darrell has something to say about it. “She sounds like a white girl imitating a black girl,” says Darrell. 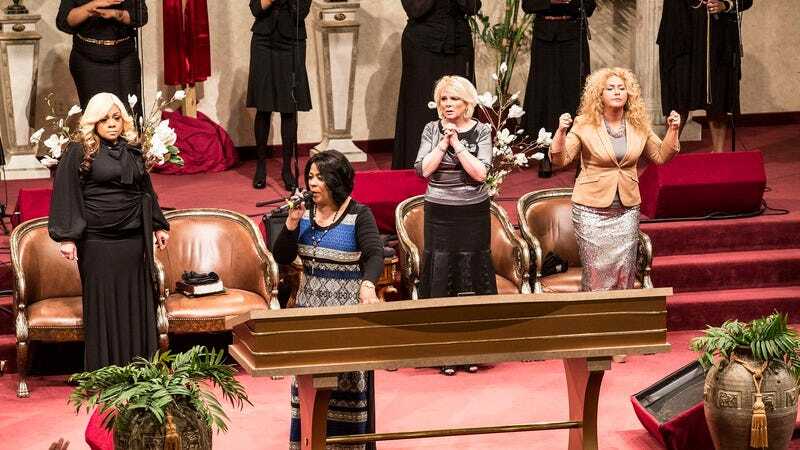 The image of two black prophetesses and two white ones galvanizing an overwhelmingly black church suggests a provocative dialogue about whether Linda and Kelly’s work constitutes cultural appropriation, and whether they think their race affects their ability to connect with their congregants. Instead of letting the women explore these issues, Preach throws to Darrell, demonstrating the producers’ inability to resist a corny punchline. The wrongheaded choice to keep cutting to Darrell, who interjects drunk-uncle caliber jokes at a weirdly frequent pace, undermines a show purportedly about women’s experiences serving in the church. When the women are speaking, it’s not often to each other, so the insights that could be gained from having them compare notes are missing, and those interactions are replaced with prickly mentoring sessions with the protégées. The mentoring sessions do lend Preach some much-needed gravitas, particularly in conversations between Belinda and her protégée Hadassah, who was raised Muslim and struggles with the way her religious conversion has negatively impacted her relationship with her mother. But more often, the mentoring sessions are excuses for the producers to play “oh snap!” music in the background as one of the prophetesses dresses down her charge. Taketa challenges her protégée Rebecca to rifle off scriptures after Rebecca’s ego rears its head, but rather than underscore the importance of the exercise to Rebecca achieving her goal, the producers intimate that Taketa will stop working with Rebecca, an outcome that never feels plausible. Preach has conceptual potential, but its producers are too eager to massage it into a more typical, less honest, and ultimately boring show. The producers put great effort put into making the worst possible version of Preach, even as you can hear the muffled screams of the much better show inside it. Perhaps the prophetesses should have brought their message to the editing bay, where numerous signs from the universe were willfully ignored.